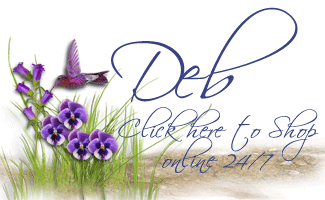 Welcome to our Creation Station Blog Tour! On this tour, we’ll be featuring some of the newest and most fun products and techniques. The stamp set we’ll be featuring is called Sheltering Tree, and it has taken off like a whirlwind! I think it’s one of the most versatile sets, that you can use year-round, and change up to suit any occasion. There’s an incredible fun designer series paper in our Sale-a-bration brochure that you just have to try! It’s called Irresistibly Yours, and we’re going to show you what makes it so irresistible. Spritzing is the technique we’re featuring, and it works perfectly with the Irresistibly Yours DSP. To travel through the Tour, simply click on either the ‘Back’ or ‘Next’ buttons, or you can click on individual blogs from the list at the bottom of this post. All of our blogs are linked in a circular fashion, to make sure you don’t miss a single creative project! 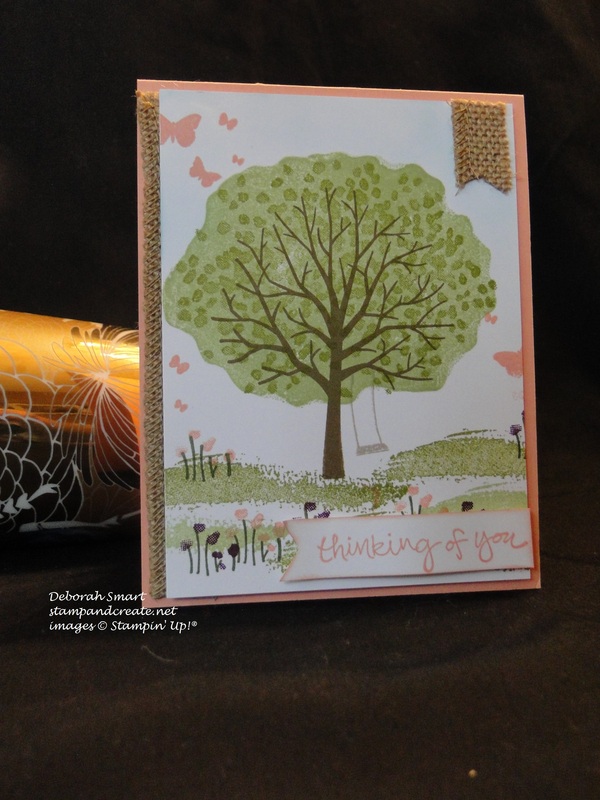 My first card is a simple one to show off the Sheltering Tree stamp. I’m getting rather tired of cold and rain, so I decided to go with a nice springy theme. I used a panel of Whisper white card stock on which to stamp; the tree is stamped in Soft Suede, Old Olive and Pear Pizzazz. I used a trick I learned while at Leadership convention – to get the outline of the tree ‘leaves’ (the large background green), I turned the leaves stamp backwards on the block, and stamped the solid outline in Pear Pizzazz. I then flipped it over, and stamped the leaf image in Old Olive. Pretty cool, right?! I used the same colours to stamp the grass, and Mossy Meadow in for the flower stems. The flowers were stamped in Blackberry Bliss and Crisp Cantaloupe. I used Crumb Cake ink for the swing, and Crisp Cantaloupe again for the sentiment and the butterflies, which are from the Perpetual Calendar stamp set. Using Sticky Strip, I attached a piece of Burlap Ribbon to the back of the stamped panel, and cut a banner shape from the same ribbon and attached it to the top right corner. Then I layered the whole piece onto a card base of Crisp Cantaloupe card stock. My next card is quite unusual for me – it’s quite minimalistic! It was all I could do to not add more embellishments or butterflies, and let the Irresistibly Yours Specialty Designer Series Paper be the focal point. What makes this paper so irresistible is that it’s just that – a resist design! I chose to use the scallop design, and to show it off, I used my Coastal Cabana re-inker in a mix with rubbing alcohol in my Stampin’ Sprizter. I sprayed the ink several times, allowing it to dry in between sprayings (the heat tool is great for speeding up this process!). I did this so that I could achieve a depth of colour, plus I wanted the colour to be darker at the bottom, and lighten towards the top. After each spraying, you simply take a paper towel to wipe the excess ink off of the resist pattern, and you have a beautiful display. I wanted to stay with the scallop pattern, so I used the Striped Scallop Thinlits Die and cut a piece of Whisper White card stock, and layered it under the spritzed DSP, and on top of a panel of Whisper White card stock. I would 4 pieces of Coastal Cabana and White Baker’s Twine around the Coastal Cabana card base, then layered the panel on top. I stamped the sentiment from the Sheltering Tree stamp set in White Craft Ink, and heat embossed it in White embossing powder. Then I had to walk away before I added anything else! I like playing with special folds to create cards, so for my final card I made an accordion card, and used some more of the Sheltering Tree stamp set. I started with a base of Mossy Meadow card stock, and glued on panels of the new Painted Blooms Designer Series Paper. I stamped 2 trees, this time using Crumb Cake ink for the trunks, Old Olive and Pear Pizzazz for the leaves, and then stamped the leaves a 3rd time with Crisp Cantaloupe ink randomly tapped on the stamp, to look like blossoms. 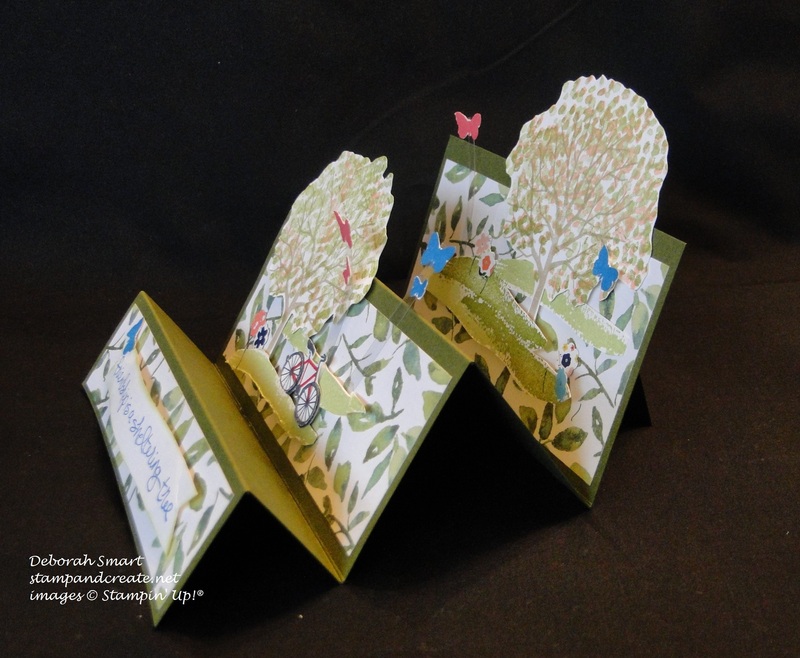 I then stamped the ‘grass’ pieces, the bike and butterflies (again from the Perpetual Calendar stamp set), and hand cut everything and attached to the card base using Stampin’ Dimensionals. I added the butterflies to small strips of Window Sheet, so they would appear to be flying. The little flowers I punched out from a piece of Flower Pot DSP, using the 1/2″ circle punch; I was trying to keep the scale small. I hope you’ve enjoyed my projects for this Tour, and that you’ll take a minute to leave a comment with your thoughts. Then, head on over to Justin’s blog for more great projects by clicking the ‘Next’ button, or head back to Jennifer’s projects for a second look by clicking the ‘Back’ button. If you’d like to order any of the products I’ve used on these projects, you can click on the icons below & be taken to my online store. 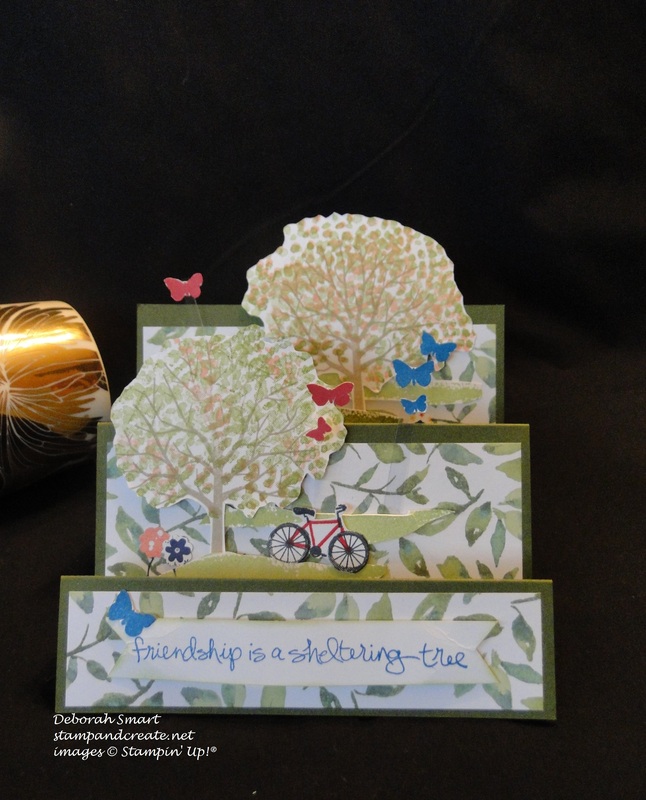 Thanks for taking the Creation Station Blog Tour with us – until next time, Happy Stamping! Awesome card ! I love what you have created with this set ! Hi Deb, great projects – I first is my favourite. I’m a sucker for burlap and I love how you have used the paint imagery as grass, so clever! I can’t believe I haven’t gotten the Sheltering Tree yet! 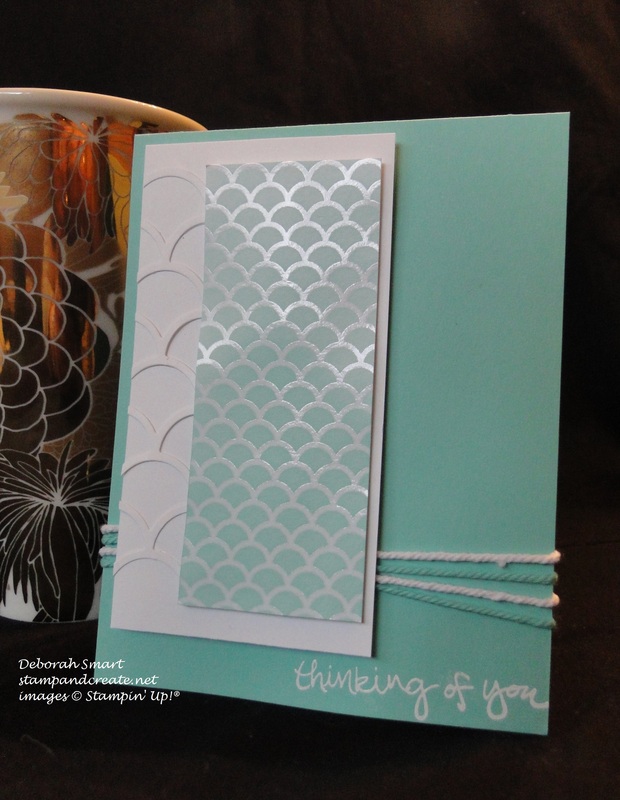 Great samples to inspire (what a fun accordion card!) Great idea to pair the Irresistibly DSP with the scallop thinlit. Great coordination! I thought everyone had Sheltering Tree, Heidi! LOL 🙂 I appreciate your comment, and your taking the time to visit!